At Gerald and on Maud. The Tate catalogue points out that Millais's painting depicts the "beginning of an ill-fated friendship between Maud, daughter of a woodsman called Gerald, and the son of the squire. Years later they have a love affair which cannot end in marriage because of the difference in social rank between them. Maud gives birth to an illegitimiate child, drowns it in a pool and goes mad." 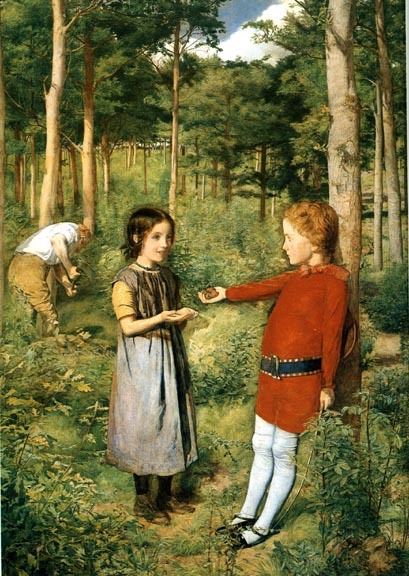 In other words, The Woodman's Daughter is one of several paintings by the Pre-Raphaelite Brotherhood and their associates that involve either a tale of tragic love or the seduction of a poor girl by a wealthier man. Examples of tragic or unrequited love and its results include Millais's Isabella and Hunt's sequel, Isabella and the Pot of Basil, various versions of Ophelia by Millais, Hughes, and others, and Millais's Huegenot and Mariana. Paintings about seduction include Hunt's Awakening Conscience and The Hireling Shepherd and Ford Madox Brown's Take Your Son, Sir [GPL]. The Pre-Raphaelites. London: Tate Gallery/Allen Lane, 1984. No. 32. P. 86. The Woodman's Daughter on the Guildhall site.